In order to protect our National Security, military and government agencies require higher levels of security from their paper shredders. 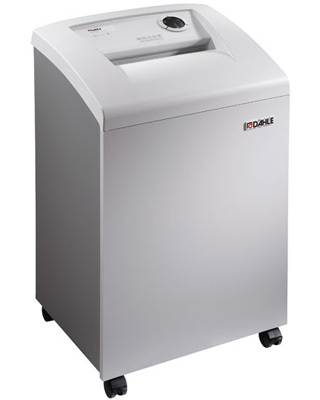 This Dahle High Security Shredder is NSA approved for NSA/CSS Specification 02-01 capable of reducing a sheet of paper into over 15,500 tiny particles. These particles are so small that they have been rendered impossible to reassemble. In a world of uncertainty one thing is for certain, whatever you put through this shredder, we guarantee will never be read again. This machine is designed for military, federal, state or local governments as well as Department of Defense contractors engaged in projects where National Security is an issue. Designed to be used in a small office or by a team of employees for the destruction of top secret documents. Dahle's 40334 is built with a 10 1/4" feed opening to accommodate both letter and legal size paper with ease. It uses the latest technology to offer full electronic capabilities including such safety features as Automatic Shutoff when the cabinet door opens and Auto Reverse to prevent an overfeed. Automatic On/Off and Bag Full Auto Off are features that offer both convenience and satisfaction in knowing you will be notified when it's time to change the bag. Equipped with a built in EvenFlow Lubricator automatic oiling system. This system provides slow, continuous lubrication across the entire cutting mechanism and ensures peak shredder performance.